Hall & Oates in Montreal or Quebec City? Inform me about the next events for Hall & Oates. Enroll yourself to our priority waiting list for Hall & Oates to be alerted when new tickets are available. Filling this form doesn't engage you to any purchase. Hall & Oates will be coming to Montreal on July 13th, 2018 for a concert at the Centre Bell. 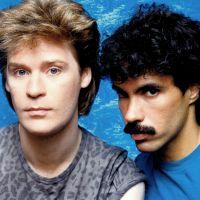 Daryl Hall and John Oates have had tremendous success throughout the late 70's and early 80's with #1 hits such as "Rich Girl", "Kiss on My List", "Private Eyes", "I Can't Go for That (No Can Do)", "Maneater" and "Out of Touch". Together, Hall & Oates have sold over 40 million records throughout the world. Don't miss their anticipated return to Montreal !